LISC Chicago recently completed its $40 million Campaign for Stronger Neighborhoods – an ambitious effort to fuel community development efforts across the city. As a result, LISC Chicago is active in more neighborhoods, developing more community development leaders and funding more nonprofit partners than ever. Our Annual Impact Report and our new publication, Citywide. Neighborhood Deep, document much of the success that is resulting from the campaign. We get things done, but we aren't finished yet. 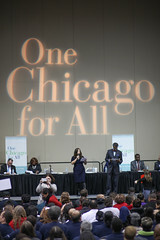 Your future commitment to Chicago neighborhoods is critical to LISC's work and we are grateful for our collaboration. Donations of any size, from $10 to $10,000, will help LISC fulfill its mission of connecting neighborhoods to the resources they need to become stronger and healthier. Head over to the national LISC donation page, and don't forget to designate Chicago LISC as the recipient of your donation. Thank you from LISC Chicago and all of our neighborhood partners.